So you’ve just finished your kitchen, right? It’s all tiled and caulked, all of the appliances have been installed without issue. Then you look up and notice there’s a huge, empty gap between your cabinets and the ceiling. Don’t panic! CW Interiors has you covered with a few simple ways to seamlessly incorporate this forgotten section into the rest of your kitchen space. You know how we love our wall art here! Any opportunity for a gallery wall is an opportunity we wouldn’t miss for the world. Sure, this won’t be your traditional art wall (since it’s on more of a “loft”), but we can still make a stunning statement here. This “art loft” is especially great for filling expansive spaces. So if you have a large open space above your cabinets — let’s get artsy! Shimmer and Shine All Day and Night. Nothing makes a place feel quite as warm and cozy as good lighting. Get some battery-operated twinkle or fairy lights and drape them in and around the space above your cabinets. Put them on a timer, stand back and watch them work their magic in one of your home’s most awkward and hard-to-reach spaces. Are you looking for something to go in that blasted gap that you can easily change out with the seasons? Then a garland is for you. Not only are they fantastic works of art that turn whatever room they’re in into a statement, but they come in all sorts of varieties for every season. Plus they’re relatively inexpensive and, if you’re the DIY-type, you can even make your own! Pull it Together with a Curtain. If only we lived in the perfect world, where all kitchen cabinets had windows over them that look out onto magnificent scenery. Unfortunately, we live in the real world where that’s not always the case. So instead, install a tension rod, grab some fabric you love, and create a judgement-free zone to store all of your junk. Chalk It Up To Smarts, Why Don’t’cha? Chalkboard paint is honestly a blessing disguised as a fun kids’ room shtick. Have you ever bought tickets for an event, or made plans with friends, months in advance and then suddenly, oops! It’s the day of the event and you forgot to make arrangements for work or babysitting. Want to know the best way to avoid that? A giant calendar smack-dab in the center of your kitchen. 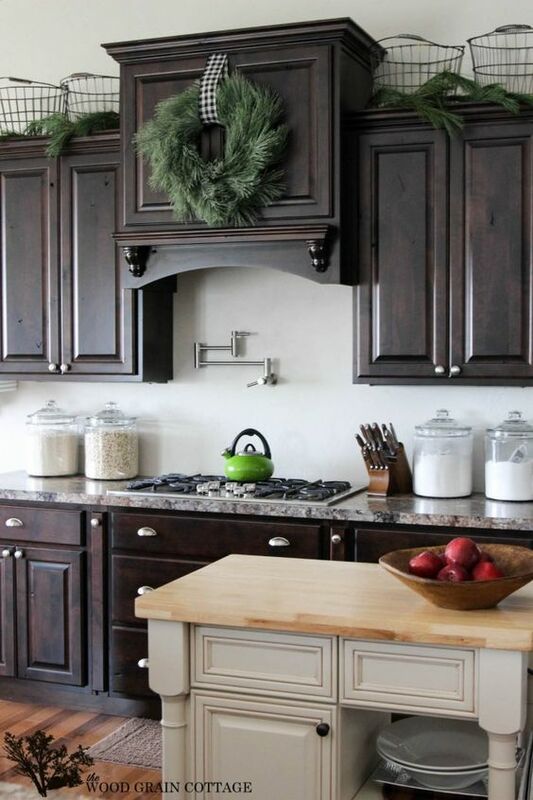 Chalkboard paint is perfect for transforming that empty spot above your cabinets into a blank canvas for calendars, to-do lists, artwork, and more. There you have it! Five ways to transform that gap between your kitchen cabinets and the ceiling. If you have any questions, contact us or stop into the store. We’re always ready and eager to help our customers!